The annual 3-day Who Do You Think You Are? Live exhibition at Olympia in London, is happening this week (Thursday 20th Feb through to Saturday 22nd). The Family Historian stand is 302 (half-way up the left side of the hall), so if you're going to be there, come over and say hello. We'll be doing demos and showing videos. We're also offering special fair discounts, so it's a great opportunity to pick up a copy of the software at a bargain price. Readers of this newsletter will remember that Family Historian sponsored an Australian cruise (4th Unlock the Past Genealogy Cruise) this year. The cruise has just ended and was very successful. Jane Taubman, renowned Family Historian expert, gave a series of workshops on Family Historian. The Australian blogger, Jill Ball, a Family Historian user who blogs as GeniAus, was on the cruise and has written about it, and in particular has high praise for Jane's presentations - see The Problem Solving Presenter. Jill also recorded various interviews which can be seen at http://geniaus.blogspot.co.uk. As well as sponsoring the above-mentioned Australian cruise, Family Historian is also sponsoring a British Isles cruise later this year. 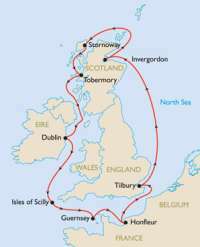 This is the 5th cruise organised by Unlock the Past, and it will sail on 19 July 2014 from London for eight ports in Scotland, Ireland, Guernsey and France. Jackie Depelle, a Family Historian specialist, will be presenting and offering expert advice on Family Historian. See 5th Unlock the Past Cruise for more details. Visitors to the Who Do You Think You Are? Live exhibition at Olympia will also be able to find out more about it at the Unlock The Past stand (Stand 932). There will also be an opportunity to meet Jackie Depelle who will be at the exhibition for all 3 days, and presenting each day at 12.15. She will also be at the Family Historian stand (Stand 302) for at least part of the time. We've recently updated the Events page on the Family Historian website with information about up-coming courses on Family Historian, user meetings, and other events � mainly in London, UK, and Yorkshire. We will be adding more details of other events as we hear about them. If you are organising user meetings for Family Historian, or other Family Historian related events, let us know (email info@family-historian.co.uk), so that we can add them to the Events page.